I remember the evening when I decided I would start TINT in 2011. I was in my college dorm room scrolling through Facebook to procrastinate the inevitable decision that my entrepreneurship professor tasked our whole class with: come up with a business idea and take it as far as you can for our semester project. I saw a Facebook post that shared “ever heard of…” with an image and a glowing recommendation about a specific book. I was then curious about the book, looked it up, thought it was something I’d be interested in reading, and decided to purchase it. It wasn’t until a few minutes later that I realized how serendipitous and powerful that word of mouth recommendations was, and how social media and smart phones really unlocked the scalability of personalized recommendations. I started thinking how I could create something that would allow these relevant recommendations to be utilized effectively and not just get lost in a vast social network. The first version of this manifestation was called Hypemarks and aimed at consumers. It quickly flopped as we didn’t gain any traction, but I was not going to give up that quickly. 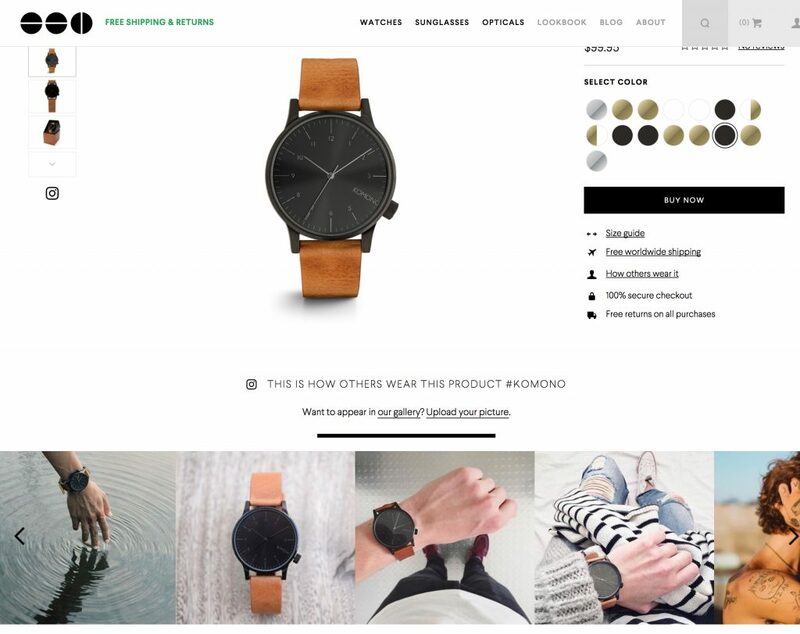 I surveyed some some brands who used Hypemarks and asked what they enjoyed about the platform, and their consistent feedback was the aggregation technology and wanting to display that content on their website. And thus TINT was born in January 2013. Over the past 4.5 years building TINT, we’ve operated with the mindset that TINT’s value add to our customers was our social media content aggregation technology and displaying it on websites, screens, jumbotrons, and anywhere a brand marketed their product or service on to customers. But we kept running into the similar issue. No matter how bold and exciting our vision was to us, we could not get our customers to buy into the full picture. For example, a customer would only use TINT on their website for a campaign aggregating customer photos and then stop using us a month after. We kept educating that they could use TINT and display the powerful user-generated content (personalized recommendations) on their TV screens or events or jumbotrons in tandem or after their campaign, but still nothing stuck. 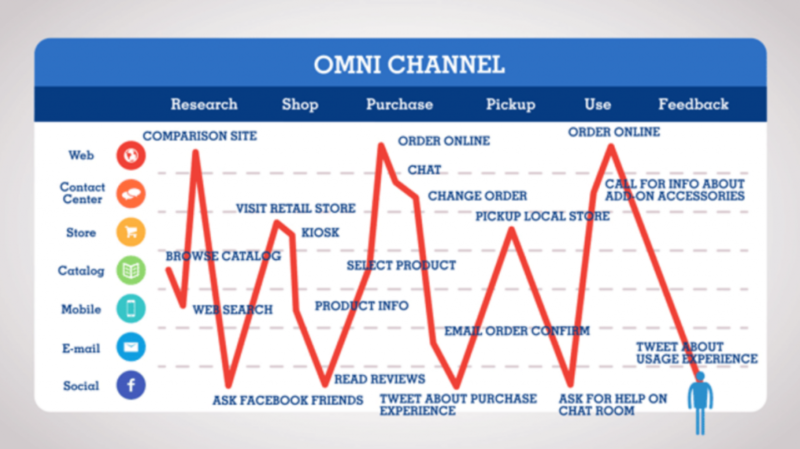 The chart above shows all the channels a brand can market or be marketed on today throughout the customer journey/experience. Not only do marketers have to manage digital (websites) and physical touchpoints (retail store), but also manage channels they own (outdoor billboard ads) and do not own (3rd party review sites). But the biggest pain point we heard beyond managing these channels was what content to use to engage customers. Why? 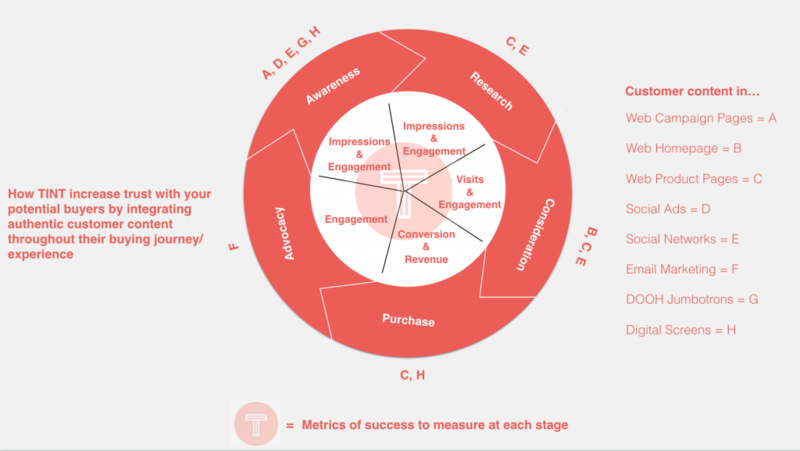 Content is expensive to create, timely to manage, and difficult to measure effectiveness. Like Thom mentioned above, customers are expecting personalized content experiences based on where they are in their buying journey to help make their decisions easier. Headache much? This is where TINT can help solve these major headaches and challenges. 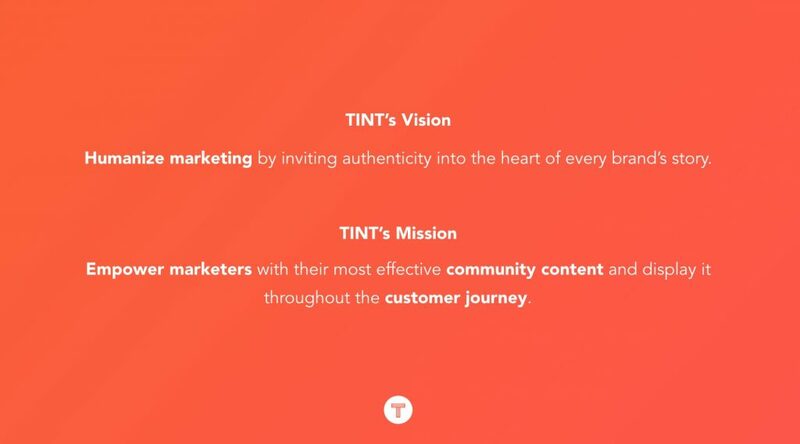 Understanding the CMO’s future concerns + embracing the original vision of Hypemarks of scaling word of mouth recommendations + all the learnings from our customer needs in the past 4.5 years, I am very excited to share the next step for TINT, summarized in our new vision and mission. So… what does this all mean to you as the marketer? Instead of a bunch of generic billboard ads you see on the subway on your way to work or sneaky online re-targeting tactics that overwhelm you with thousands of vendor options, what if you had relevant recommendations shared with you from people just like you throughout every step of your buying journey? From the time you see a print magazine ad of someone just like you (not a paid model) wearing a beautiful watch you admired to the moment you’re on the same watch brand’s product page ready to press checkout because you saw how 5 other people like you rocked the watch, wouldn’t it make your purchase decision that much less stressful and that much more confident? It certainly did for me when I purchased my last watch at Komono. 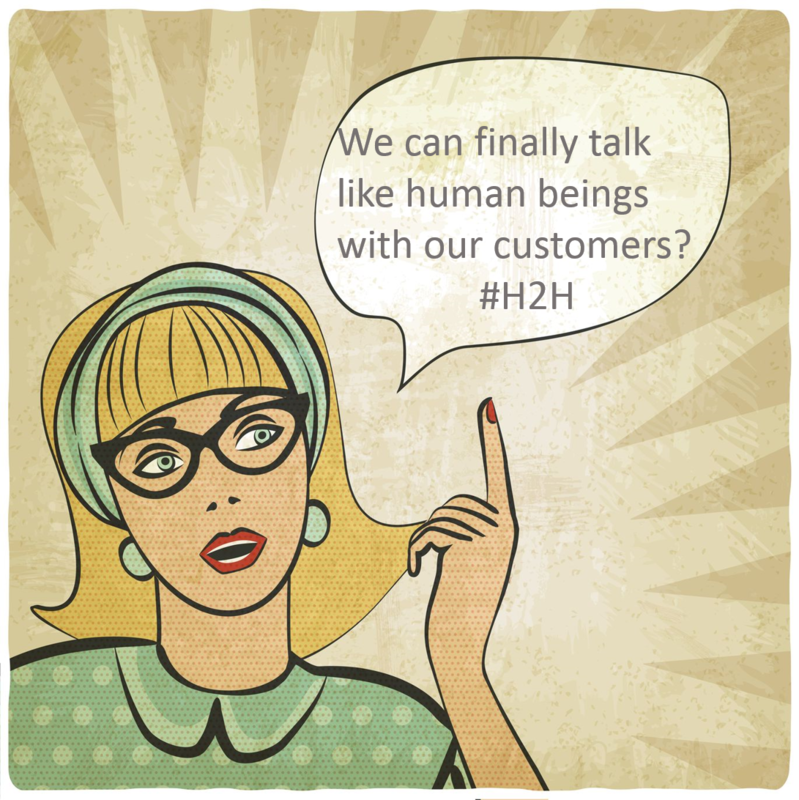 Watch companies aren’t the only brands that can benefit from humanizing their marketing. Any industry that has tons of options (hotels, universities, tourism orgs, F&B chains, FMCG brands, etc.) should explore integrating authentic customer content throughout their customer experience. Why? Their marketing all sounds the same. But I guarantee their customers marketing on behalf of the brand will not. Leveraging and displaying this social proof allows them to differentiate, stand out, and instill confidence to future customers throughout their decision making process. So how can you as a marketer actually accomplish this without eating into so much of your time? Our future stands strong with our mission: Help brands humanize their marketing by empowering marketers with their best customer content and displaying it throughout their customer journey. We are thrilled with this ambition because we believe marketing shouldn’t have to be manipulative anymore, rather consistently authentic to build trust & loyalty with the end customer. Everything we do, create, and serve at TINT will center around transparency in our communication, empathy in our product, and empowerment in our education. And the TINT platform is our tangible manifestation of this goal, and here is what lies ahead. Think of the TINT platform broken down by 5 pillars: Collect. Curate & Clear Rights. Brand. Display. Analyze. Wherever your customers are talking, rating, reviewing, commenting about your brand, we aim to build systems that will collect that content so you have access to a well equipped library of assets. One recurring challenge we hear from marketers is knowing which content (out of the thousands) to use for their marketing channels. Enter HUE, our machine learning engine that will educate the marketer which content is most effective in lifting conversions based on public and proprietary signals. HUE will eliminates guesswork from the moderation process, saving valuable time and reducing room for error. After finding the best content proven to lift conversions, we will have a state of the art rights clearance system to gain rights to that content from the author so legal teams never have to worry about repurposing customer content across marketing channels. We know each brand wants and needs to have unique, beautiful, and engaging marketing experiences to stand out. Depending on how marketers will want to repurpose their customer content on specific channels throughout the customer experience, our continued investment in elevating our API, CSS, and out of the box visualizations will be able to match your brand guidelines and create the viewer engagement that leads to conversions. 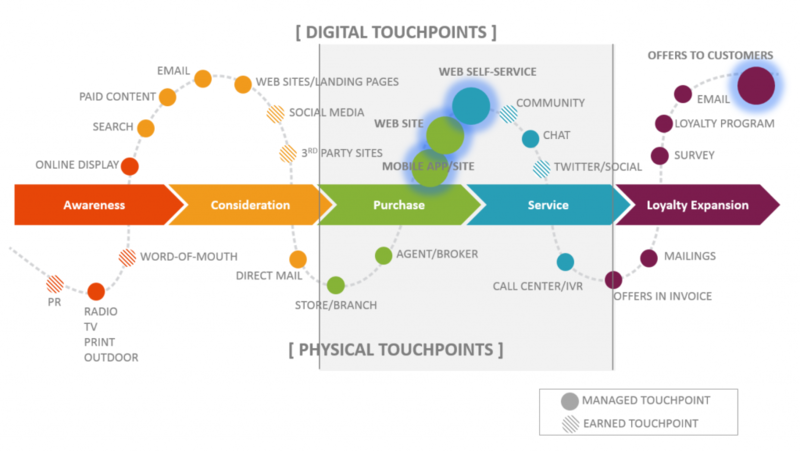 Remember the amount of marketing channels a marketer has to oversee and engage with their customers on from above? We are so excited to be rolling out integrations with the best marketing platforms out there, so you can seamlessly repurpose your best customer content, analyzed by HUE, onto your websites, digital signage, email newsletters, social ads, and physical print material. Word of mouth recommendations truly scaled and properly utilized as I had always envisioned. Marketers are always told to be more data-driven so they can make proper decisions from their experiments. We couldn’t agree more. Our revamped analytics aim to display how your customer content on specific marketing channels are converting viewers, showcasing metrics like clicks, visits, engagement, impressions and interactions increase after integrating TINT throughout your customer experience. 1. Word of mouth recommendations and social proof have always been the most powerful form of marketing. Social media and smartphones have given consumers the keys to share their opinions and thus brands a goldmine of effective content to leverage. 2. 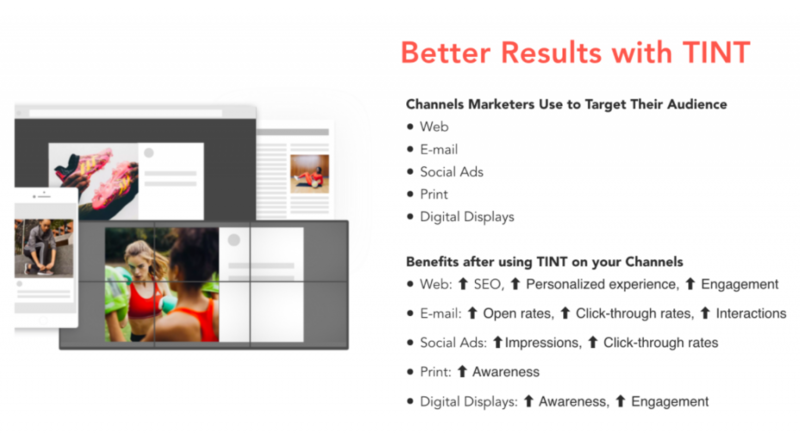 TINT’s platform empowers marketers the ability to seamlessly collect and integrate their most effective customer content throughout their customer journey, whether it be on print, digital screens, websites, email, social ads, social media, and more. 3. As a result, TINT helps increase overall brand trust and marketing performance conversions with a consistent, authentic brand story in the overall customer experience. I’d love to hear from you if you have any feedback to help us continually move in the right direction. 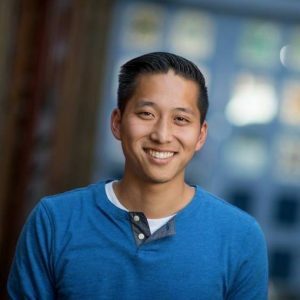 Feel free to comment below with any thoughts or email me or chat with me on social @timsaekoo. All thoughts are welcomed with open arms as our ambition is to be the primary content marketing platform that helps brands humanize their marketing!